As we draw closer to the end of the off season, I have to clear my freezer of the crayfish we caught last season. 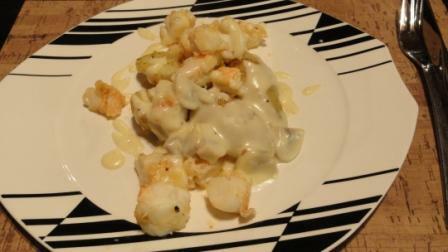 This very simple dinner of crayfish with cheese and mushroom sauce was served with sautéd potatoes. Our crayfish season lasts from November until Easter weekend with a lot more off time than fishing time as the natural resource is depleted. Sadly, it is not the recreational fishermen that are responsible for this. There are numerous crayfishing boats that operate out Gordons Bay Harbour and Harbour Island. They are allowed to catch most of the year and the size they have in their nets is smaller than those allowable for the ‘man in the street’. These fetch a huge price on the market, making crayfish quote a luxury for people purchasing them from fishmongers and supermarkets.